High channel count (768 channels). Must be compatible with existing signal cabling (D37). Must provide both a standalone data record for post-shot archive, and a real time data feed for the Plasma Control System PCS when required. 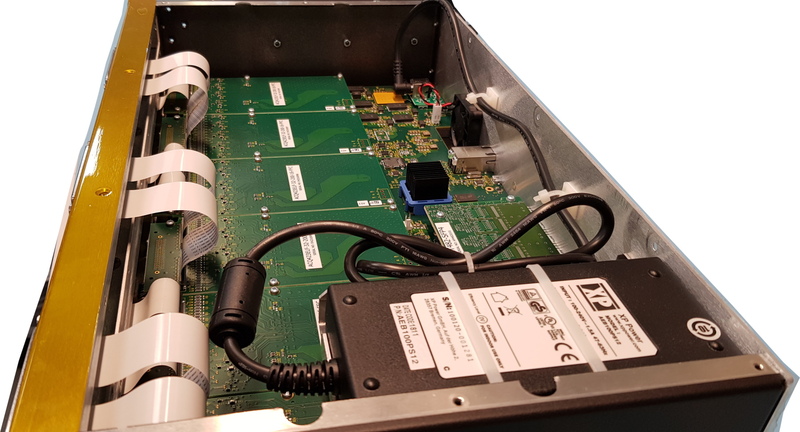 D‑TACQ's solution meets the requirements using the ACQ2106 DAQ Appliance and low cost, flex front panel modules ACQ423ELF. 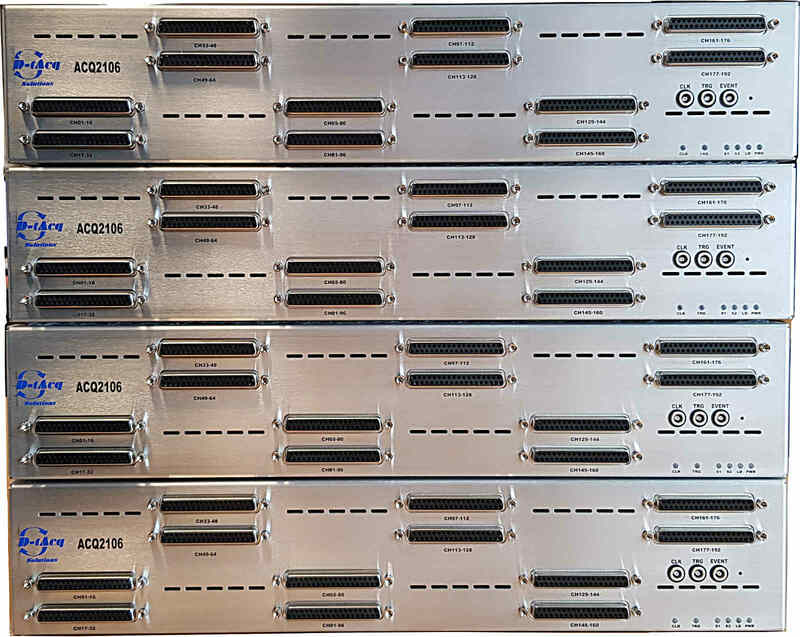 Using VHDCI connectors, ACQ2106 can take 6 modules, for total 192 channels in 1U. Previous TCV shipments featured a D37 front panel, with 96 channel in 1U. So we built a double height 2U box, the same motherboard fits 6 modules, the 2U front panel now accomodates 12 x D37 connectors, and there's room to fit the AC mains brick inside as well, making for a compact and robust solution. All 4 boxes share clock and trigger on a shared clock/trigger highway. The Thomson system requires a 5V input, so the +/-5V range is selected on ACQ423ELF. During operation, the system is configured to capture one sample on all channels every laser flash. The samples are stored in local DRAM and then uploaded to MDSplus in the normal way for all diagnostics at TCV. 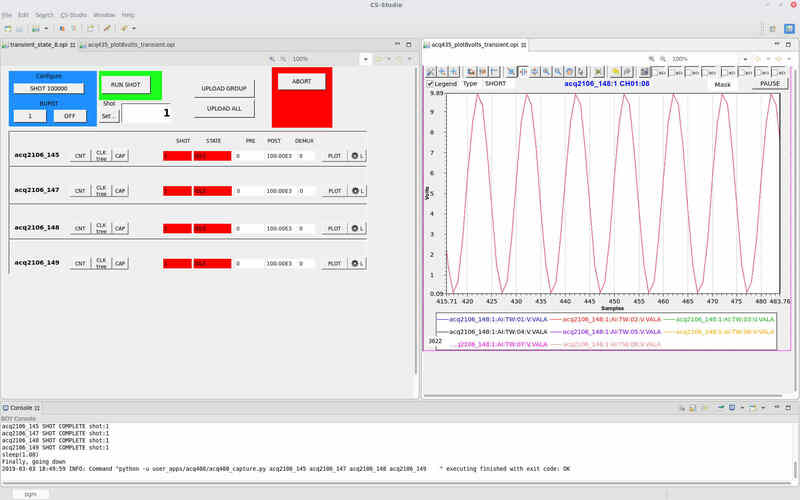 Real time data for the PCS is provided on a parallel fiber-optic path. 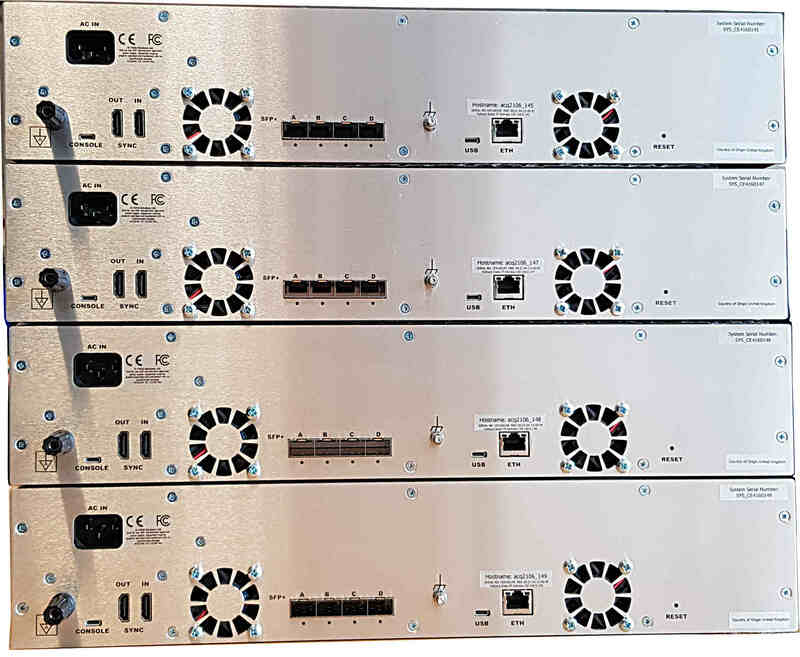 Each of the four boxes connects back to a single host PC using a dedicated fiber-optic data link running at 6Gbps. The Ethernet data upload proceeds whether the RT feed is connected or not. 768 simultaneous channels in 8U. Quality analog input, 16-bit, differential. Signal input on D37 connectors, compatible with existing cabling. Embedded system inside, result data transferred on Gigabit Ethernet after the shot. Data is presented to the PCS in well under 10 usec from every sample.